Did Topps win any awards from customers for their latest online set? 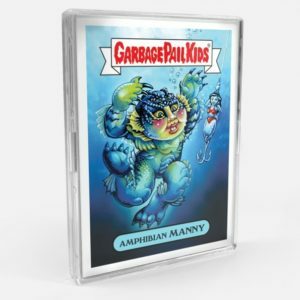 Today Topps revealed the print run for 2018 Garbage Pail Kids Not-Scars online set. The set with celebrated the recent Academy Awards show was a mix of both GPKs and Wacky Packages. In the past customers were not on board with award show sets. However this set bucked that trend with total sales of 172 copies. This handily beat the other awards sets and held its own with recent online holiday releases. The results are a little surprising considered customers only receive 8 cards with a $34.99 price tag. However, the art in the set has been well received by collectors, garnering much better reviews compared to the Valentine’s set. It shows that when the art and gags are done well, collectors are willing to purchase. With awards season coming to a close no word yet on the next online release. Check out galleries and checklists for past online sets at GeePeeKay.com.